Shopping for diamonds and jewelry can be an extremely overwhelming and complicated experience. However, with the right guidance and an understanding of the basic principles, you can learn to be confident with your choices and excited about making a purchase for your loved ones. Jennifer and Melanie are here to help guide you through the process and make it fun and personal. You no longer need to go to your friend's dad's diamond guy... we are here to help! We select only the most exquisitely cut diamonds that have been individually checked and perfectly matched for your chosen setting, budget and preferences. In order to understand diamonds, one must know that every stone is unique. No two diamonds are exactly alike. Therefore, in order to understand a diamonds' qualities, we depend upon the Gemological Institute of America’s (GIA) globally accepted standard for describing diamonds, otherwise known as the 4 Cs of Diamond Quality. Of the 4 Cs, the "cut" is the most crucial component to a particular stone’s overall beauty and value. The Cut is an objective measure of a diamond’s light performance or “sparkle”. In an ideally cut stone, the light entering the diamond reflects internally from facet to facet, and is reflected back out only through the top of the stone (called the Crown), thus creating the fire and brilliance of the stone. If a diamond is cut too shallow or too deep, light leaks out the bottom or the sides of the stone, causing the stone to appear dark. The shape is an important consideration when buying a diamond as it directly influences price. Round Diamonds are the most popular diamond shape comprising of roughly 80% of all diamonds, and they therefore tend to be priced higher than other 'fancy' shapes because of market demand, increased manufacturing costs, and their incredible brilliance. 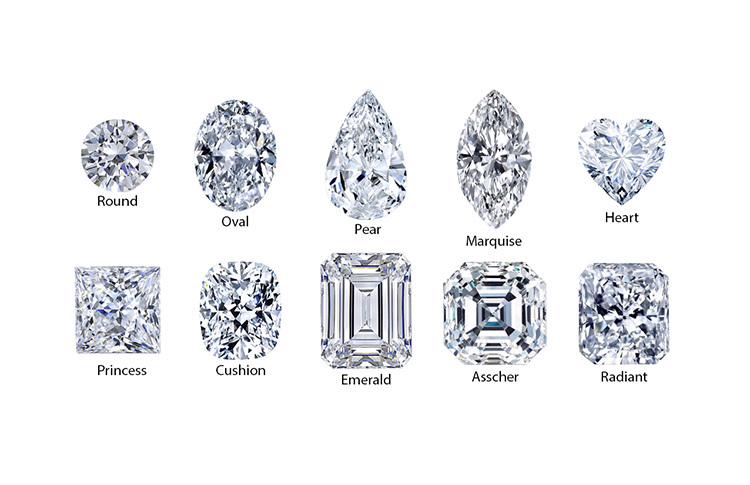 Fancy shape diamonds include all diamonds other than round, including oval, pear, marquise, heart, princess, cushion, emerald, Asscher, and radiant. There is not right or wrong when picking stone shapes, it is simply a preference and all are stunning. Color is generally considered the second most important attribute when selecting a diamond. A diamond’s color grade refers to the lack of color present in the diamond. The GIA grades diamond color on a scale beginning with D, which represents “colorless”, and continues to Z as the presence of color increases. While most diamonds appear to have no color to the untrained eye, in fact most stones usually contain slight tones of yellow. Diamonds in the D-to-F range are considered “Colorless”, and therefore are the most expensive. Diamonds in the G-to-I range are considered “Near Colorless” and are often considerably less expensive. Beyond the I-grade, diamonds are considered to have “Noticeable color”. A diamond’s Clarity grade is based on the number, size, and location of the imperfections that occur in almost every diamond. These imperfections, often referred to as inclusions, determine a diamond’s clarity grade. The more frequent and greater the size of inclusion the lower the clarity grade. The external imperfections are referred to as “blemishes”. Most imperfections tend to be microscopic and generally do not affect the overall beauty of a stone. When selecting a diamond, the buyer will determine if he/she is comfortable with the imperfections in a particular stone, since every diamond will have a different occurrence of imperfections. We advise a buyer to choose an “eye clean” stone, which means that to the naked eye you cannot see any imperfections. These stones are usually VS1,VS2, SI1 or SI2. One should always keep in mind that depending on the location of an inclusion, once mounted in a ring, it is very possible that an inclusion will be hidden all-together by the ring setting that one selects. Carat is a measure of a diamond’s weight. A carat is one fifth of a gram and each carat is divided into 100 "points". The larger the carat weight, the more rare and valuable the diamond. Properly proportioned diamonds will look larger and more beautiful than most poorly cut diamonds. All else being equal, diamond price increases with Carat weight because larger diamonds are more rare, and thus more desirable. The sparkle of a well-Cut diamond can make it appear larger than the actual carat weight might suggest. The human eye tends to detect sparkle before color, which is why Color is generally considered the second most important characteristic of diamond, after Cut. As diamond size increases, Color becomes more visible. In general, one will not notice a difference in Color without jumping two color grades. When considering an "H" versus an "I" where all other factors are similar, the lower color grade might be worth the savings. The type and color of the ring setting can affect the appearance of the diamond. You must see a diamond in person and cannot just go off the GIA certificate - that is what we are here for. We look at the MM ratio of the stone and examine the stone under a jeweler's loop to make sure it's exactly what you want. Contact us below to learn more on how we can help you buy a diamond!